Prince George’s County, Md., partners with Motorola to construct a state-of-the-art facility for a county once considered lacking in interoperable communications. The partnership has also led to construction of a new public safety complex, including homeland security and a 911 backup center. PRINCE GEORGE’S COUNTY, MD.—Prince George’s County public-safety communications once was labeled as the “donut hole” in the center of radio communications interoperability in the Washington, D.C. region, but that is no longer the case. A partnership with Motorola Solutions provided the agency with interoperable, first-responder-conscious radio equipment and a state-of-the-art facility that have transformed the county into one of the premier 911 communications agencies in the D.C. area with future expansion plans. Those expansion plans include construction of a public-safety complex in Landover, Md., which will house the county’s new 911 backup center and the county’s Office of Homeland Security. Prince George’s County Public Safety Communications Center in Bowie, Md., takes 1.3 million emergency calls per year—30% of which may be misrouted from surrounding counties, said Charlynn Flaherty, associate director of the county’s public-safety communications. In 2005, the agency decided to invest in its radio system to address communications limitations. When Prince George’s County decided to purchase the $70 million Motorola 700MHz P25 radio system, officials recognized that the high-tech system would contrast the facility housing it. Prince George’s County's executive team presented the building opportunity to Motorola, and the company obliged by responding to a request for proposal (RFP). In 2011, Motorola built the inside of the facility, while a separate contractor handled the center’s outside construction. The technology company also provided technicians for of all the various systems used at the Prince George’s center. The $35 million center spans 40,000 feet, includes 63 dispatch stations for 911 call-takers and fire, EMS, 911 and law-enforcement dispatchers, along with 21 days of generator power and equipment that primarily comes from Motorola Solutions. The team will implement Motorola Solutions’ computer-aided dispatch (CAD) system by the end of the year. In addition to providing technology support, Motorola tuned into the practical needs of Prince George’s staff with other final touches, according to county officials. The center includes a training room with communications stations—a feature that has reduced training times and improved the preparedness of new call-takers, Flaherty said. The breakroom features a full-service, stainless-steel equipped kitchen and oversized reclining chairs for the dispatchers, who clock 10 to 12-hour shifts. 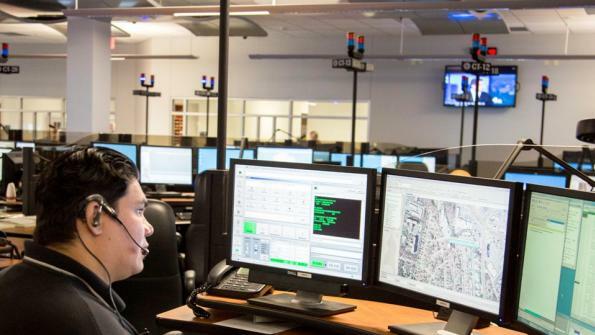 The facility adds a level of comfort, but also efficiency, for the employees on the frontline of saving lives, said Tracey Savoy, a senior emergency dispatch aid for Prince George’s 911 who has worked as a 911 dispatcher for eight years. Before the rebuild, the stations had fewer screens and less mapping capabilities, she said. “It helps, because we have two screens for maps to match up, if someone’s doesn’t know where they are,” Savoy said. “We actually have three maps and two screens for maps. It really is much better." Customer input determined most of the design of the facility, said Michael Leonard, Mid-Atlantic territory vice president for Motorola Solutions. The Prince George’s team has had the same influence on Motorola’s second building project with the county. The $32 million, 46,000-square-foot facility will serve as the county’s Office of Homeland Security headquarters, as well as the county’s 911 backup center, emergency-management and emergency-operations center. Motorola and Prince George’s County broke ground on the new center last year. Operations in the new center are scheduled to begin this fall, according to a county official. Prince George’s forethought to partner with the telecommunications provider is a successful example in providing top-notch emergency communications that other agencies—within the region and nationally—can model, Leonard said. This article first appeared in sister publication Urgent Communications here.